One of the most important steps we took was spending time in dental offices around Pittsburgh. 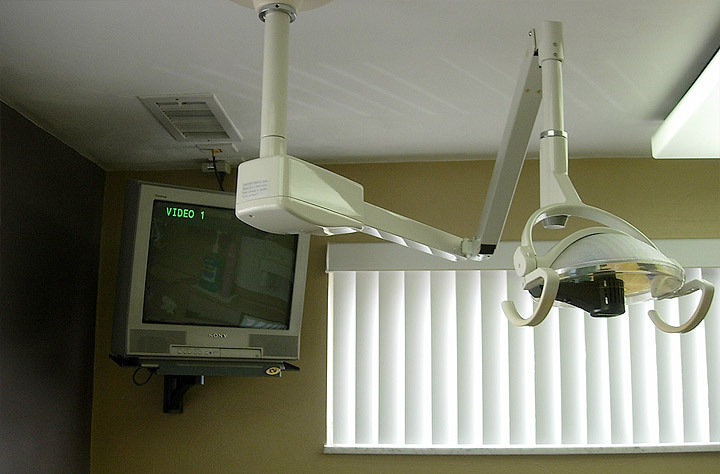 We observed, took notes, and captured video of their dental software. This alone was more insight into the dental process than we could have ever gotten from a second hand account. However, we took it a step further and modeled the data from our visits into several different perspectives, each providing a key insight. See the report for the exhaustive details, but here's a quick overview. 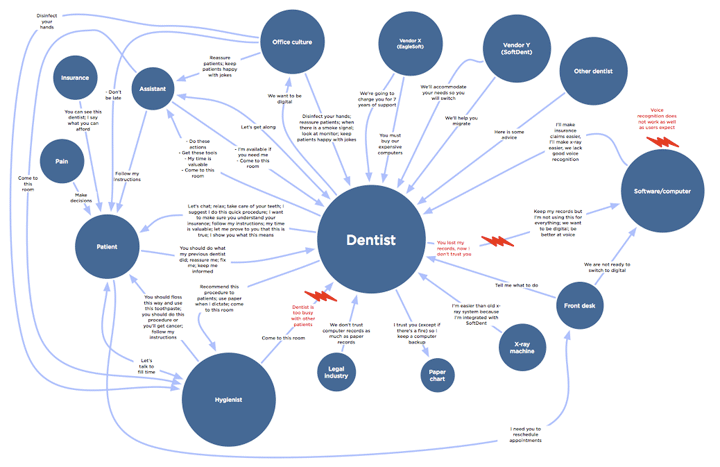 Intuitively, it makes sense for there to be clear boundaries between what a dentist does and what a hygienist does. However, these boundaries break down as soon you start looking at many practices. To help alleviate this, we broke down the responsibilities into the given set of roles seen above. 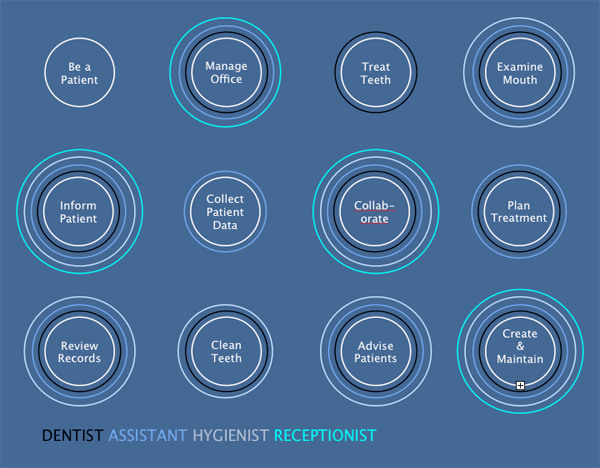 Dentists spend their time treating teeth, but they also manage the office, inform the patient, and maintain records (and more!). Similarly, hygienists do a lot more than cleaning teeth. Each role has a number of problems associated with it, expanded upon here. Creating and Maintaining records was perhaps the most problematic. No office had a single set of records; instead, information was duplicated between paper and the computer. This was worsened by the fact that records were not identical between the two mediums. Often, assistants or dentists would transcribe what they described as "the most important information" from paper to computer. Our glimpses were limited by the amount of time we were there, but one could imagine that this would present an issue when a certain piece of information needs to be reviewed. Does someone refer to the paper record or the electronic record? Another problem inherent to the role was the poor design of the electronic charts. Inputting information into them was time consuming, and often all of the initial recording happened on paper. Even paper was sometimes too slow - in one case, we observed the dentist dictate his findings to the assistant only to find the assistant had fallen behind. Another key role was Reviewing Records. The purpose of collecting and recording data is to be able to use it in some practical manner at a later data, but few paper or electronic charts seemed to support that notion. A number of problems with electronic charts were found especially. For example, the user can not quickly switch between different types of information, although that is essential when reviewing records. Sometimes the makers of dental software seem to forget that it will be used in an operatory setting. 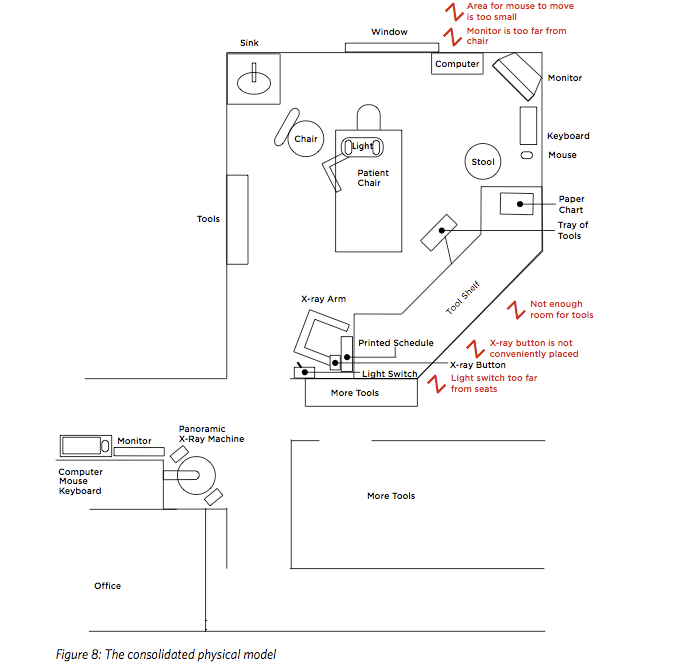 Understanding the physical setup of the room is vital for the success of a well integrated system. Although the diagram above might not make it obvious, space is very limited in dental operatories. Generally, all the tools a dentist needs cannot fit in the room itself, and overflow containers of tools are kept on shelves just outside the room or in another room altogether. 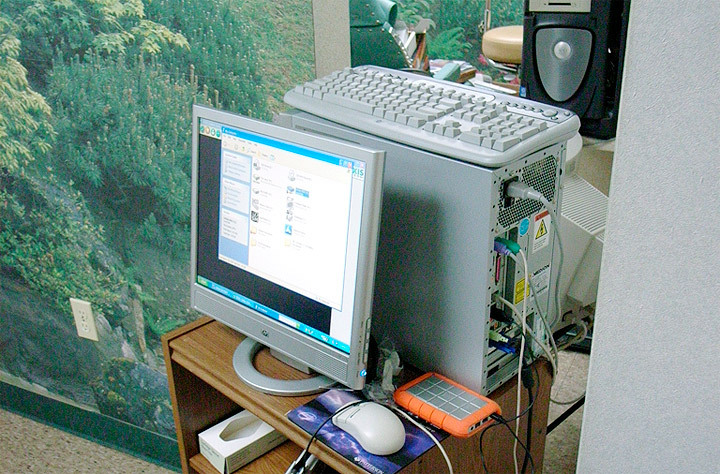 Similarly, this lack of space resulted in cramped computer setups. These cramped setups led to a number of flow issues, discussed below. 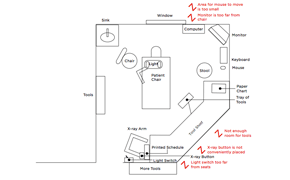 Another aspect of the physical setup was that important parts of examinations occurred in different rooms. The panoramic x-ray was always in a different room than the operatory, and the patient had to be led there and back during an examination. Computers were often split across rooms as well, with supporting computers for scanning x-rays or importing photographs in a different office. 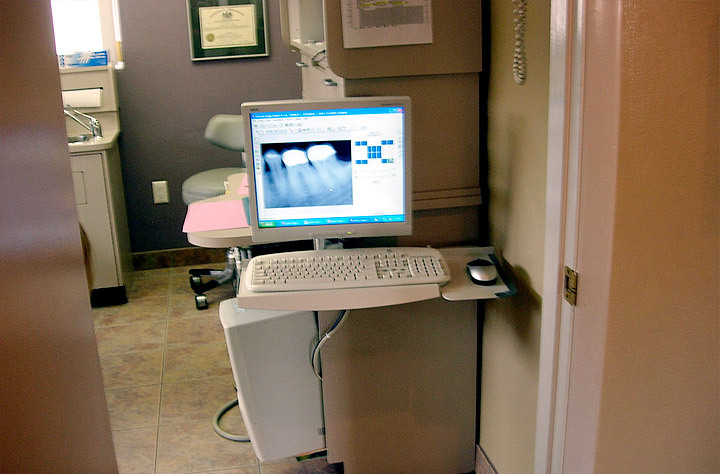 Dentists went through elaborate steps to integrate hardware into their environments. Wall mounted keyboards and mice (see below), although clever, were ergonomic disasters. Similar, the space constraints made apparent by the physical model caused dentists to place keyboards in inconvenient places. This offers a clear and simple design implication: we need to integrate our system into the room. At first glance this most likely means getting rid of the keyboard and mouse and depending on some other type of interaction. However, another possibility may be looking at innovative keyboard and mouse designs intended for space limited environments. A trackball, for example, might be a big boon for large mouse movements. Also, privacy concerns need to be kept in mind. 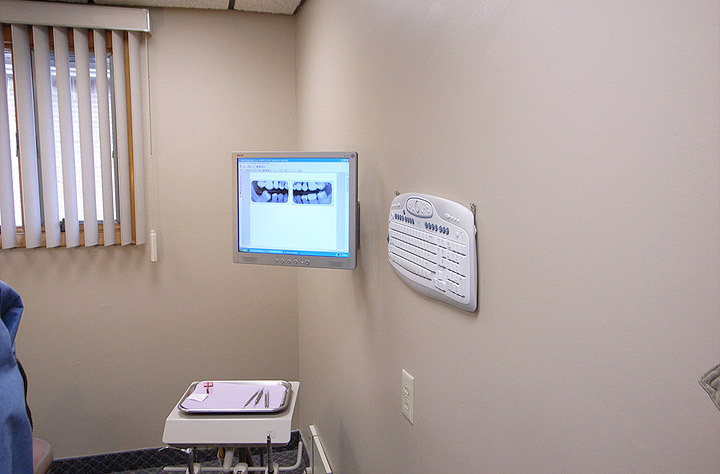 While a large screen might be good for displaying more information, there could be confidentiality concerns, especially if the screen is observable from the hallway. An important design element often forgotten is supporting the culture that exists within a group.The most consistent aspect of dental office cultural is that collaboration is not only expected, but also vital to the whole process. Staff consistently asked one another for help, generally physical help for getting tools or diagnostic help with understanding problems. Usually, this manifested itself by yelling over to the next operatory asking for assistance. In one of the larger offices, however, this meant a formal 'smoke signal' system. In this system, staff could trigger certain sounds -- waterfalls, lion roars, etc -- to play across the entire dental office. Each sound corresponded to a person and upon hearing that sound they knew they were needed. A bit complex, but it certainly illustrates the importance placed on collaboration. One last cultural observation, but still an important one, was that time is extremely valuable to dentists. They were the largest bottleneck in the office, and assistants were constantly telling them a patient was ready. Dentists would have to push back, saying they were busy and would get there as soon as possible. In one extreme case, this resulted in a patient waiting over 30 minutes for the dentist to come and complete the exam. This could have been a large cultural breakdown, but assistants and hygienists compensated by talking with patients during this downtime. To make our design more consistent, we boiled down our findings from contextual inquiry and other background research into a set of design implications. Design for a role, not a person - Many different people review records. It is important to design for this role, rather than explicitly designing for the dentist. 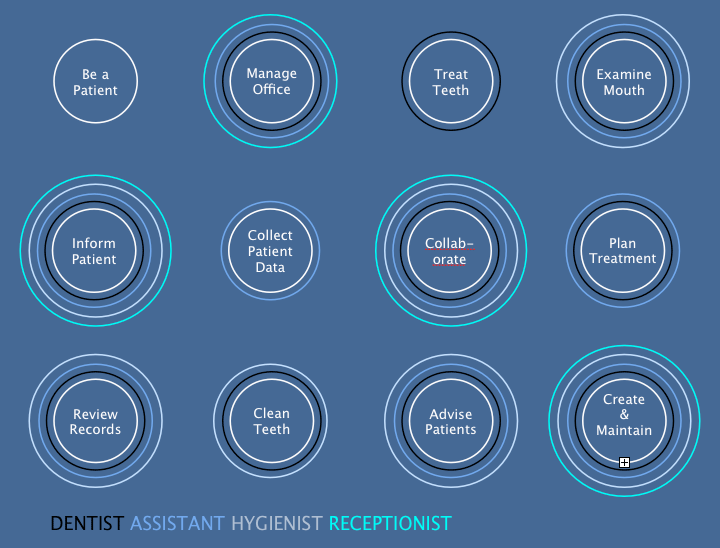 The system should be usable for assistants and hygienists as well as dentists. Efficiency is vital, especially for the expert - Dental offices are extremely concerned with efficiency. This system must enable experienced users to quickly acquire the information they need. Physical integration is key - Space is very limited in the operatory. There is not enough room for a mouse and keyboard, nor is there usually a good location for them. The system we develop must be well 47 integrated into the physical environment to avoid these problems. Make it easy to see or switch between many different pieces of information - dentists often need to switch between different kinds of information. Our system must ensure that it is easy to see all the relevant data at the same time, and/or that it is quick to switch between information types. Explore different ways to display information on charts - There is currently no standard for the symbols that are used on hard and soft tissue charts to represent various conditions or procedures. Whatever we choose, we should be consistent and clear throughout our system.